When thinking of family picnics of childhoods past, closed soggy sandwiches with lackluster fillings may come to mind. Floppy iceberg lettuce, cheese, and tomato, or perhaps your family preferred the classic afternoon tea-style cucumber sandwiches, perfectly cut into bite-sized triangles? Well, it’s time to do away with the old and switch up the picnic game a notch or two. Revolutionize your picnic basket this summer with some of the best artisan products in town, and take your alfresco dining from high street pickings to haute couture fantastic! We are going to show you what to fill your picnic basket with, and not only will you be able to choose the right products to perfectly pack for your day out with the kids, we will show you how to cut your picnic prep time in half, if not completely. You’ll be able to have these items delivered straight to your door, and most of our selected products are freshly prepared and packed and ready for you to sling into your hamper. There will be no buttering or layering before you leave the house and by the time we’re done here, we hope you will most certainly be convinced that Aperitivo- or tapas-style picnic snacking is the way to go. Forget what you think you know about dried and cured meats, Kara’s generous meat-laden bags adorned with 1950’s tattoo insignia are not just a unique take on the humble bar snack but robust with flavor and texture. The cool and quirky brand is a wonderful reflection of the creator behind all the meaty magic. Orange hair, perfectly placed piercings and awesome body art are the signature attributes of our resident femme butcher. My favorites have to be the Angus tips, moist with just enough textured bite to get your teeth into. Lightly spiced with Spanish smoked paprika, garlic, onion, and Kampot black pepper, these morsels of yumminess are oh-so-moreish and free of artificial flavorings. Partner with a premium lager or craft beer, and for the more luxurious palate I would stretch to popping these in the mouth while washing them down with a medium dry Prosecco. The pork cracklings were a revelation. The light and crispy texture of the cracklings are unlike pork scratchings, which are usually a little more brittle. Seasoned with a unique spice blend that Kara has coined “Piggy Stardust”, the Butcher Brouilette pork rinds resemble and taste more like perfectly fried pork crackers that could easily accompany a bowl of Chicken Chow Mein or in the case of a picnic, a glass of Pimms! The beef jerky has a slightly more traditional taste and texture, however, is more thinly sliced into wonderful shards perfect for gnawing at. Chew alongside the spiced sausage, which I would partner with a mini, picnic-basket-sized bottle of red Bordeaux (or a normal size – who’s judging!). The packaged cured meats are ready to go and can be slung straight into the basket or hamper. Slice up the sausage as you like and pass by a local deli for some olives to add to the mix. I bet you were wondering when bread would make an appearance in your basket? Well, gourmet food brand Jar Jar Minx brings you Mediterranean flavors with culinary flair and creativity. These spreads and dips are the perfect accompaniment to a crusty loaf or French baguette. No. Don’t slice or butter your bread, no need. Simply rip a generous portion of your choice of artisan bread and lovingly spread with or dip into one of Charlotte’s scrumptious tapenades. Alternatively, stack an open sandwich with a spread of your choice and enjoy. I would also pair these tapenades with beautifully thin slices of Italian Parma Ham, and wash it down with something dry like a crisp Chardonnay or Pinot Grigio. 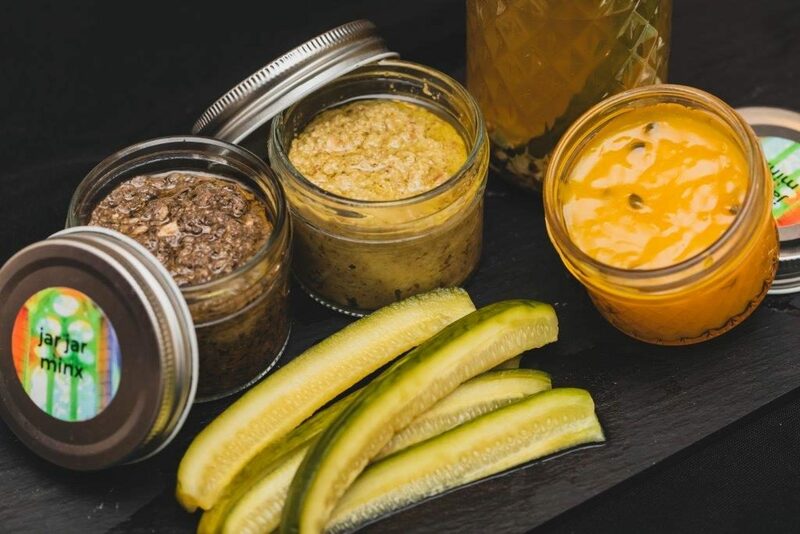 Olives, nut and fresh herbs play key roles in Jar Jar Minx’s delicious creations, which also include a variety of unique jams and even rich liquors. The Provençal tapenade, made using black and green olives, dried tomatoes and herbes de Province is hearty and packed full of flavor. I am a massive fan of garlic and so, of course, the Roasted Garlic tapenade is perfect for those who like a powerful hit of flavor, which is beautifully partnered and slightly tempered by green olives and almonds. Yum. Enter Queen of Nuts, Elvira! Free from artificial flavorings and with no added sugar, Elvira’s Nuts is the perfect brand for those seeking healthy but hearty nut-based products that can be perfectly matched with yogurts, fruit, and more! Elvira has taken the health-conscious arena by storm without compromising on taste. There’s no shortage of choice when making a purchase of delicious items to fill your breakfast bowls, or to spread on breads, or sprinkle over just about anything of your choice. This brand is a crowd-pleaser, and your family can’t go wrong by including some of Elvira’s offerings in your picnic basket. 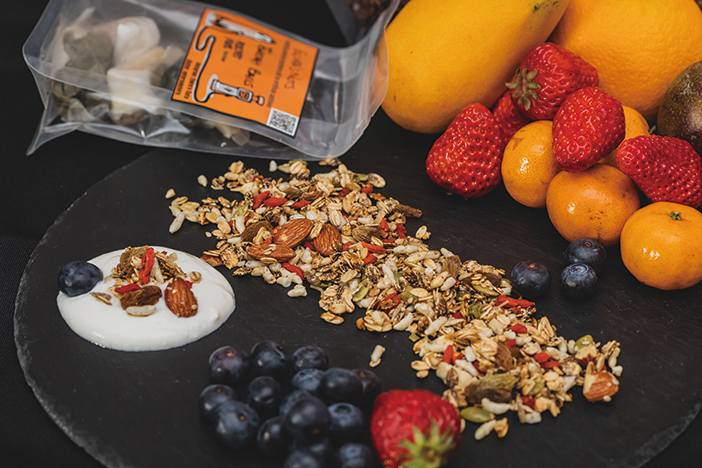 Elvira showed us how to stack a recycled glass jar with Greek yogurt and either her fruity muesli or crunchy granola, along with a layer of her sumptuous tooth-achingly sweet natural chocolate spread. Get the kids involved and perhaps partner it with a sustainability project (get the kids to collect used jars at home, wash them out and put to one side for picnic days). Don’t worry about doing your layering at home, get the picnic blanket down and get the kids to create their own DIY layered muesli and yogurt jars while at the park! Elvira’s jarred spreads are equally delicious. 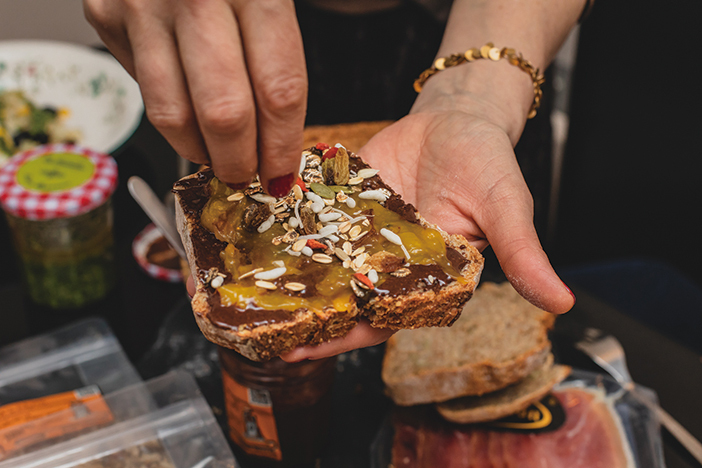 Again, whip a bit of crusty bread from your baguette or loaf and get dipping, or get the kids to make sweet and sticky open sandwiches with almond and hazelnut chocolate spread, layered with one of Jar Jar Minx’s curds! Yes! Choose from passion fruit, Meyer lemon, and Mandarin Orange. If the summer heat gets too much and the kids need a little pick-me-up, hand out the delicious energy balls, made with an assortment of dry seasonings, dates, goji berries, coconut, ginger, and sesame butter. Partnered with some fruit and a handful of Elvira’s homemade coco pops, they’re light and sweet and dissolve on the tongue. Save some for breakfast in the morning and serve with almond or soy milk. You can expect so much more from this brand, including yummy muesli bars, lemon bars, and passion fruit Maracuya bars, perfect for snacking or adding to the kids’ school lunch box. Also check out her eclectic mix of homemade cereals, healthy cakes, relishes, and chutneys. So we’ve given you open sandwiches, artisan snacks, dips, and spreads and suggested what to match them with – it’s now time for a carb fest! Homemade pasta is the way to go. Don’t worry about overboiling your pasta penne, cooling and adding jarred mayonnaise, the kids probably won’t touch it and it’ll no doubt end up sitting lonely in Tupperware in plain sight of the sun, going warm. Jorge will sort you out, with his beautifully prepared pastas and I kid you not, gastronomic Italian sauces. Founder of La Factoria, Jorge Cordero is the creator behind the brand that is a small factory churning out fresh and dry homemade pasta and sauces right here in Beijing. His passion for Italian food and flavors developed when he spent time working for a restaurant-pasta factory in Fuerteventura, Spain, owned by an Uruguayan family with Italian roots. It might never have occurred to you to bring along lasagna to a picnic, but this a gourmet picnic after all, and when perfectly layered lasagna is made to order and delivered to your door – why not? Put under the grill for a few minutes, seal and bring along to enjoy with the family. Cooked pasta can be a joy to eat hot, slightly cooled or cold in a salad. Cordero’s Pasta Salad was prepared using his homemade fusilli, which made a wonderful addition to the artisan hamper. You will be spoiled for choice when making an order for your picnic, and we recommend ordering some surplus for dinner! Choose from stuffed ravioli, chicken tortellini, spaghetti, tagliatelle, and robust pestos, including Genovese (made with basil), red pesto (made with tomato and nuts), pesto cream, rocket pesto (made with arugula), Bolognese and so much more! On brown bread spread Cordero’s preservative-free Genovese pesto or red pesto, and wash down with white or red wine. You’re very welcome. Cue slow-mo frame of you and the kids waltzing into your local park, gourmet picnic basket in hand, hair flowing in the slight summer breeze, as mouths catch flies when you bring out your epic artisan hamper. Open sandwiches? Cured spiced meats? Tapenades and homemade pestos? Yes – you’re winning! Share the gourmet love and get everyone on the epic picnic basket train.